The LockBox Wallet is a lightweight, super functional and waterproof wallet perfect for cyclist or other outdoor sports. As in many of my articles I will combine a LockBox Wallet review with telling the story of the LockBox entrepreneurs and how they moved from an idea to a real end-product. First let’s have a look at the design of the LockBox wallet. The LockBox wallet is just slightly bigger than my Garmin Edge 510. 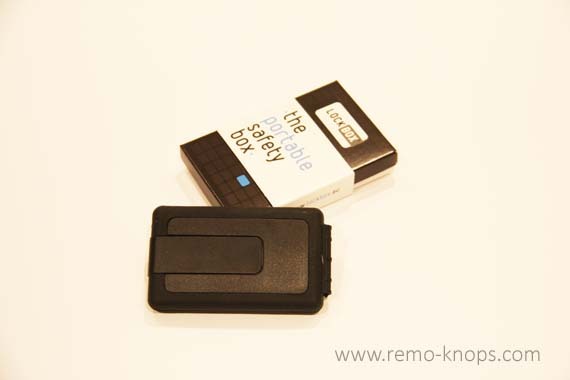 The exact dimensions of the LockBox wallet are 10.5 cm x 6 cm x 1.5 cm (L x D X H), which results in an easy fit, even in one hand. The design reminds of a shell design you see in nature. Two parts slide over each other in a male-female design to make the LockBox wallet a real waterproof wallet that keeps your paper money and medical record safe. LockBox calls this the inner lips system, and you feel both parts snap together when closing the LockBox wallet. The jaw lock keeps both the LockBox parts securely together. Although I’ve ordered the LockBox wallet in a complete black design, you instantly notice the two different materials used when you pick-up the LockBox for the first time. A hard plastic middle part that provides strength to the design, while the edges feel like a silicone material that adds the waterproof capability to the LockBox design. When you open the LockBox wallet you will see both parts next to each other. 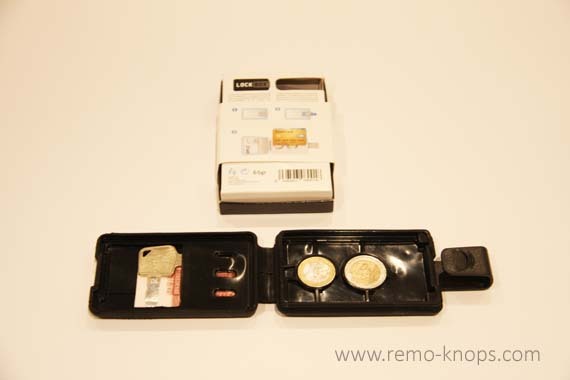 In the right half you see room in the silicone material to store a 1 euro and a 2 euro coin. On top of the coins you can store two or maximum three plastic cards. For example an insurance card and a Maestro card to pay for a cup of coffee while out for a bike ride. In the left half you will see a pelican pocket. Personally I use the pelican pocket for my home key (no key chain) as well as some paper money. The initial spark came from the cycling world, and I bet that fellow cyclist recognize themselves in using plastic zippers to carry some cash and items in case of emergency. I used the Ikea ISTAD zippers (0.4 L) to protect my smartphone from the elements and add some paper money to it. However putting coins and a smartphone in one bag is not a good idea if you would like to keep your phone scratch free. So I was looking for a resolution for quite some time on found the LockBox wallet online, after I wasn’t satisfied with the design of the Pokitt wallet. From this initial idea the Lockbox entrepreneurs needed to develop a unique value proposition, in this case the Lockbox wallet, for the specific customer segment of cyclists and outdoor sports that were identified as intended users for the Lockbox wallet. For the technical development a key partner was needed, with a unique skill set and network that could be labelled as key resources for the Lockbox entrepreneurs. But also the drive, enthusiasm and collective team efforts were striking facts when I read the background information on the Lockbox Wallet. The composition of an entrepreneurial team is known as one of the key success factors of a start-up/venture. The LockBox team decided to use Platinum silicone which is one of the key materials used for the product. 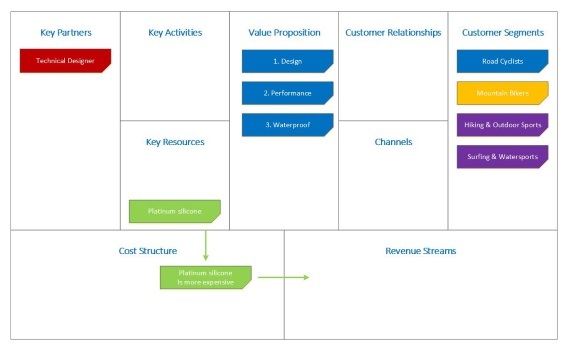 Although it impacts the cost structure and operating activities to work with such a material, it also contributes to LockBox value proposition and create that high performing product that the team had in mind. I’m using the LockBox Wallet for a little more than 1.5 years now during my weekly bike rides. It’s a small, well designed and very waterproof wallet that every cyclist will love. I think it will be a very suitable wallet for hiking, outdoor- and water sports as well. The best features of the LockBox wallet are the well designed closing lip that makes it really waterproof, and the holders for a 1 and 2 euro coin prevent the coins from making noise. Also the use of two very complementary materials (the hard plastic shell and the premium platinum silicone) is brilliant. Would you buy this wallet as well?